Another fern with bold foliage, Pteris parkeri is a medium to tall growing species that grows well in strong filtered light. The full name is Pteris cretica ‘Parkeri’ and it will reach 50cm in height in good conditions. This is a fast growing fern that comes temperate to sub tropical climates. It will grow in cooler areas, however it does not cope with frosts. 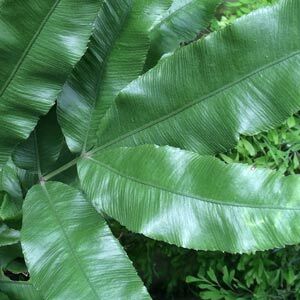 The fronds are a mid to deep green, darkening as they age. The broad foliage creates good texture in the garden or fernery. Best grown in semi shade and it should not be allowed to dry out in our hot summers. At the same time, good drainage is important as Pteris parkeri does not like water logged conditions. Also suited to growing in containers as an indoor plant. Choose a draft free position and keep the plant away from sunny windows, although allowing good strong indirect light. Light to heavy shade – A little morning sun is OK, however hot sun will quickly scorch the foliage. Prepare soil well by adding a good amount of compost and moisture retentive material. Fertilise using a liquid seaweed fertiliser every 3 weeks from spring through to late summer. Some blood and bone applied in early spring will be beneficial. Keep in shade during summer. Water in the morning or early evening in summer. Watering during the heat of the day can cause foliage burn. Pteris parkeri can be tidied up with the removal of of old dead foliage as is required.